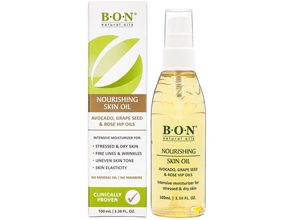 BON Liquid Gold Pure Tissue Oil is a clinically proven face and body tissue oil, formulated from natural oils to nourish your skin and thus help improve the appearance of scars, stretch marks, wrinkles, ageing and dehydrated skin. Suitable for all skin types including those with sensitive skin* – safe* to use on the whole family. Picture your skin having that silky smooth soft glow, soothed from those red blotchy rashes often associated with the use of chemical skin care products. * Improved skin firmness & elasticity. * Reduced stretch mark and scar appearance. * Ideal for sensitive skin*. Availability: Online and at Clicks stores.